Human fetus, enclosed in the amnion. For the alien race in Stephen R. Donaldson's The Gap Cycle, see Amnion (Gap Cycle). The amnion is a membrane that closely covers the embryo when first formed. It fills with the amniotic fluid which causes the amnion to expand and become the amniotic sac which serves to provide a protective environment for the developing embryo or fetus. 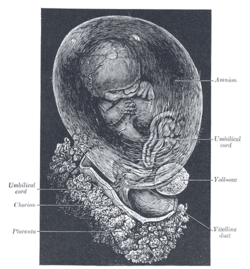 The amnion, along with the chorion, the yolk sac and the allantois form a protective sac around the embryo. In birds, reptiles and monotremes, the protective sac is enclosed in a shell. In marsupials and placental mammals, it is enclosed in a uterus. The term amnion is from Ancient Greek ἀμνίον 'little lamb', diminutive of ἀμνός 'lamb'. it is cognate with the English verb 'yean', bring forth young (usually lambs). The amnion is a feature of the vertebrate clade Amniota, which includes reptiles, birds, and mammals. Amphibians and fish are not amniotes and thus lack the amnion. The amnion stems from the extra-embryonic somatic mesoderm on the outer side and the extra-embryonic ectoderm or trophoblast on the inner side. In the human embryo, the earliest stages of the formation of the amnion have not been observed; in the youngest embryo which has been studied the amnion was already present as a closed sac, and appears in the inner cell-mass as a cavity. This cavity is roofed in by a single stratum of flattened, ectodermal cells, the amniotic ectoderm, and its floor consists of the prismatic ectoderm of the embryonic disk—the continuity between the roof and floor being established at the margin of the embryonic disk. Outside the amniotic ectoderm is a thin layer of mesoderm, which is continuous with that of the somatopleure and is connected by the body-stalk with the mesodermal lining of the chorion. When first formed, the amnion is in contact with the body of the embryo, but about the fourth or fifth week amniotic fluid (also called liquor amnii) begins to accumulate within it. This fluid increases in quantity and causes the amnion to expand and ultimately to adhere to the inner surface of the chorion, so that the extra-embryonic part of the coelom is obliterated. The amniotic fluid increases in quantity up to the sixth or seventh month of pregnancy, after which it diminishes somewhat; at the end of pregnancy it amounts to about 1 liter. The amniotic fluid allows the free movements of the fetus during the later stages of pregnancy, and also protects it by diminishing the risk of injury from without. It contains less than two percent solids, consisting of urea and other extractives, inorganic salts, a small amount of protein, and frequently a trace of sugar. That some of the liquor amnii is swallowed by the fetus is proved by the fact that epidermal debris and hairs have been found among the contents of the fetal alimentary canal. Extra-amniotic pregnancy is a rare condition that results from a rupture of the amnion, leading to development of the fetus within the extraembryonic coelom. At the point of constriction where the primitive digestive tube of the embryo joins the yolk sac a reflection or folding upward of the somatopleure takes place. This, the amniotic fold, first makes its appearance at the cephalic extremity, and subsequently at the caudal end and sides of the embryo, and gradually rising more and more, its different parts meet and fuse over the dorsal aspect of the embryo, and enclose a cavity, the amniotic cavity. This kind of amnion is known as pleuroamnion (formed by folding), as opposed to schyzoamnion (formed by delamination). After the fusion of the edges of the amniotic fold, the two layers of the fold become completely separated, the inner forming the amnion, the outer the false amnion or serosa. The space between the amnion and the serosa constitutes the extra-embryonic celom, and for a time communicates with the embryonic celom. Cats and dogs are born inside of the amnion; it is cut open by the mother and eaten. Surface view of embryo of Hylobates concolor. Human embryo—length, 2 mm. Dorsal view, with the amnion laid open. X 30. Human embryo of 2.6 mm. Model of human embryo 1.3 mm. long. Human embryo of about fourteen days, with yolk-sac. Meconium-laden macrophages in meconium stained fetal membranes. H&E stain. ^ Pigeon, J. (1960). "Treatment of second-degree burns with amniotic membranes". Can Med Assoc J. 83 (16): 844–845. PMC 1938392. PMID 13735672. ^ Owen, R. (1857). "Description of the foetal membranes and placenta of the elephant (Elephas Indicus, Cuv. ), with remarks on the value of placentary characters in the classification of the mammalia". Philosophical Transactions of the Royal Society of London. 147: 347–353. doi:10.1098/rstl.1857.0017. JSTOR 108622. Histology image: 19903loa – Histology Learning System at Boston University - "Female Reproductive System: placenta, chorionic plate"
This page was last edited on 11 April 2019, at 19:21 (UTC).